build the brl-cad svn on VM successfully. get familiar with the Brep structure. study some about Nonuniform Scaling of Surfaces. find that the ehy.brep is lack of face and loop in brep structure.add them to make a correct brep. find that computing the longest edge size is in the bspile/nurb_tess.c and the nurbs is represented by the form of struct face_g_snurb that is different from the ON_BrepSurface.It needs to implement a new interface for the longest edge size. submit a patch of brep_debug.cpp.check if the index is in the range and string of letter. read the code of brep_debug.cpp which has many functions to debug the geometry in struct of Brep in mged. update the patch of brep_debug.cpp.add the sub command 'info T','info E' for display the information of trims and edges in brep.Also, make the 'info' dispaly the information in a range of indexed elements for keeping sync with the 'plot'. some materials: the nurbs book and Curves and Surfaces for Computer Aided Geometric Design: A Practical Guide. implement RT_ADD_VLIST(vhead, pt1, BN_VLIST_POINT_DRAW) in src/libdm/dm-ogl.c and upload the patch. make progress for subcommand 'plot SCV' in mged.The patch can display not only the control net,but the control point. 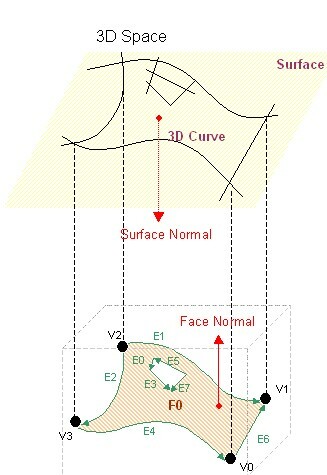 one step that make 2d trimming curve into 3d can be skip because the BREP struct has the edge in 3d corresponding to the 3d trimming curve. study the qd tree and kd tree for subdivision of nurbs surface in paper and the approximation error for the subdivision. figure out the coving triangles to avoid cracks when making boundary curve tessellation. read the opennurbs API and find the ON_NurbsCurve::InsertKnot() can make the conversion between Nurbs and Bezier if setting the parameter multiplicity equal to degree.,the ON_NurbsSurface also has the same member method. upload the patch to implement the adaptive bezier subdivision and triangle mesh display which includes the function bezierApporixmation(...),bezierSubdivision_kdtree..
SurfaceTree::subdivideSurfaceByKnots and BBNode* SurfaceTree::subdivideSurface can help me to create the kd/qdtree as a represent of bezier subdivision.But the recursion termination condition is different. Interval u,v is in gloable area, So I think the four lines above need to be modified. Read the BBNode structure in opennurbs_exp.cpp, BBNode will be used to represent the node in qd/kd tree and handling the trimcurve. the original method seem to be unsymmetric when split ell.brep sphere.brep. But the new method has not taken the edge length into consideration,so the ratio of lengths in u,v direction may be too long or too small. understand SurfaceTree::subdivideSurface() at src/opennurbs_exp.cpp,line 1528 to 1531, it comes to the same result when replacing localsurf into surf because the localsurf's domain is change along with the split. figure out the trimflag of BBNode: m_trimmed,m_checkTrim and the function of preptrim() in opennurbs_ext.pp. when a BBNode is remark as m_trimmed is true, the BBNode has been remove out from the surface. When a BBNode is remark as m_trimmed is true, the BBNode in uv region has intersections with the BRNode of trimcurve,so it need to be check again and compute the interections if needed. figure out the functions below in opennurbs_ext.h which can help me to comput the intersection between BBNode and trimcurve. add a function to sort the BRNode in CurveTree by the t in parameter region. start to implement BVNode<BV>::doTrimming function in opennurbs_ext.cpp. solve some special sitiuations: intersection on the conner of bboxing. continue to implement BVNode<BV>::doTrimming function in opennurbs_ext.cpp. deal with a special situation: trim curve is collinear with the bboxing's edge. if the start or end point of trim curve is within bboxing's edge, it is regarded as the intersection between edge and trimcurve. in function of BANode<BA>::isTrimmed(const ON_2dPoint& uv, fastf_t &trimdist) const , ' <= ' is used to compare float number. It may cause error because float's precision error,So I make some improve for it. This function will be useful in doTrimming. deal with a special situation: the BVNode covers some trimcurve's bboxing which is remarked as m_checkTrim, however, the BVNode has no intersections with any trimcurve. the method which I use may is not precise enough,So I'll try to make a better one. deal with a special situation: if a trimcurve is collinear with a edge of BBNode's uv region and a endpoint of the trimcurve is just on the uv region's conner, the conner point will not to be the intersection. insert adjacent subdivide hit into every BBNode's uv region. continue to debug 'doTrimming'.There exists a situation that some trim leafs' bboxings overlap and it is difficult to find the nearest trim leaf above a surface leaf's bboxing in uv. Function 'prepTrim' mark the surface leaf in such situation as 'm_checkTrim = true'.But in some cases, the surface leaf is trimmed out.I changed the subdivision depth to 10 manually and tested the rhino0.s in mged.Some surface leaves which should be trimmed out are still remain.So, need a more accuracy method to check it. image: some BBoxing in uv which should be trimmed are still remain(right bottom conner). a) make the node in 'TrimLoop' to form a linked list. b)for each triangle form by p0,p1,p2 successive in linked list,calculate the minimum inside angle. say sorry that I will not complete the final-evaluation for gsoc. I'v package my patch into three part after cleaning up and adding some comments. I think the subdividion is OK some more test must be done to ensure my trimming algorithm is accurate enough. because of large amount of code need to be cleaned up and test but time is up, I decide to handle my paper firstly. But I will come back and complete my work finally. This page was last edited on 28 October 2012, at 09:31.